Everyone’s heard the planner/pantser (or architect/organic as G. R. R. Martin refers to it) differences in writers. We tend to be naturally more of one than the other and can fall anywhere on the spectrum. The most common fallacy about pantsers is that we don’t plan. We do, but we plan unconsciously and it feels as if we discover much of the story in the writing, whether that’s actual draft or pre-write. This might be why we say the story comes from someplace other than our conscious mind. It does, including the planning. As a pantser, I’ve experimented with several methods for “outlining” a novel. I’ll include a quick overview of just three of these methods. I think it’s good to try different things, so you can incorporate the parts that work for you into your process and disregard the parts that don’t. Where your character starts in terms of mindset, emotions, situation, and relationships. The event that sparks your character’s story and how she reacts to it. The choices and options available to your character as a result of the event. The low moment in the story, the scenes in which your character feels all is lost. The big action or decision (the tipping point) your character makes to change their future. Where your character ends in terms of mindset, emotions, situation, and relationships. By thinking about and planning these sections of your novel, you’ll have elements to write toward. Of course, the elements might change as you write, but it’s good to have a starting point. This method works well for character-driven novels. Sometimes stories start with a character. Other times they start with a plot. Planning your pivot scenes is very similar to the MC Arc, but instead of focusing on the character, you’re focusing on your plot twists and development. Inciting moment – This is where your story actually begins. Crisis point One – This is the first obstacle/plot event. Crisis point two – A second obstacle/plot event to complicate things for your character. Crisis point three – Third plot event/plot twist, optional depending on length. The climax – The big moment of your story. Again, very similar to the MC Arc, but a good way to work with a story idea that comes to you with plot first. This is the method I’m currently working with, and I’ll admit it works a bit better for me after I’m about 20k into the story. It is my roadmap for the middle of the book as well as revisions. There’s freedom to move scenes around for maximum impact and helps ensure I don’t miss key elements. Advantages include being able to maintain micro-tension, plan chapter endings that make the reader turn the page, and spacing sub-plot elements over the length of the novel. If you have multiple points of view, it also helps ensure the POV is balanced between characters. Essentially, I make a table or draw a grid on paper and label each box with a chapter number. I plan three to four scenes per chapter and the number of chapters depends on the length I’m aiming for. Since it’s a bit more involved, I’ve included an image of a current project so you can see how I use the boxes. This particular novel has multiple POV, so scenes are color-coded for the POV character. I pre-write up to half the word count that will appear in the final novel, and from that exploratory document, I’ll fill in the boxes. This novel is targeted for 80,000 words, so I have 80 scenes broken roughly into 20 chapters (this is just a benchmark as the actual word counts per scene and chapter will vary). About 50 of the 80 scenes are noted. The rest will be filled in as I write. Pantsing is an intuitive way to write that seems to come from a hidden place in the brain, but applying just enough structure beforehand can help keep you on target and provide a roadmap of where you’re headed. If you have any questions about these methods or have used others that work, please let me know in the comments. 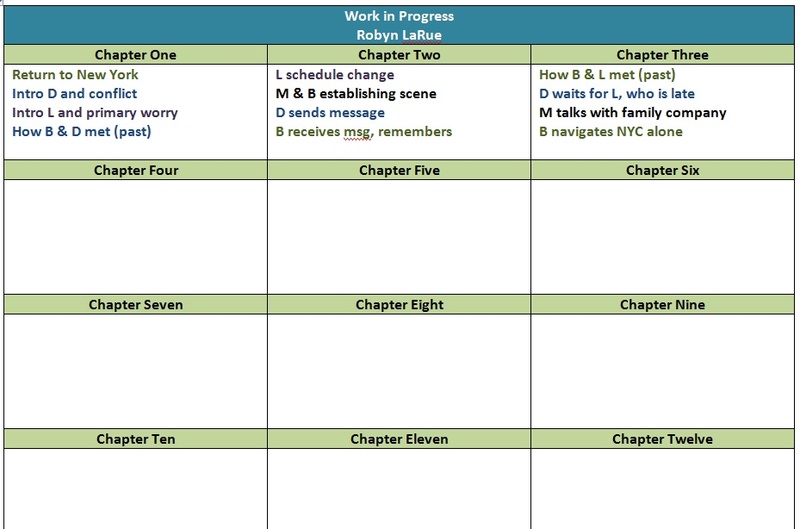 As a pantser, how do you plan out your novels? This entry was posted in Writing Process and tagged Creative Process, Robyn LaRue, Tips for Writers, Writing Process. Bookmark the permalink. 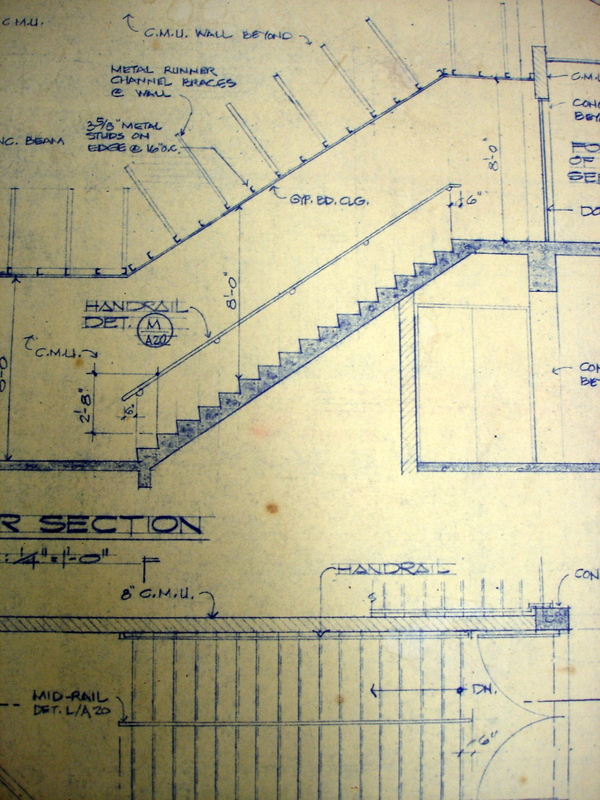 I guess I’d be considered more of a pantser, which generally works for me, but your tools for planning sound great. I’ve tried–more haphazardly–similar planning, but I like how systematically you present them. I do quarrel with the planner/pantser distinction in that I do lots of planning; I just do it *after* a lot of drafting. *Pre* planning often led me to procrastinate. I produce more and better writing when I draft a lot, then extensively and carefully sift and categorize what I’ve got and make a detailed plan based on that. When I pre-plan, I also tend to be very conventional and boring in what I imagine will work, whereas when I draft first I produce lots of crap, but I also make discoveries and surprise myself in ways I never would have anticipated. It’s not efficient, but that doesn’t matter to me, and I’m happier with the results. So I’m a mid-planner rather than a pre-planner. I like the term mid-planner. That actually fits me pretty well, too. the bulk of my scene planning happens at or just after 30k and naturally seem to journal a lot about the characters and events beforehand. It feels like I work out who the characters are in the pre-write and the plot in the actual draft, if that makes sense. Hey Robyn – this post is so many levels of awesome my brain almost cannot handle. I’ve only kinda-sorta-not really outlined my first 4 novels. However, for #4, I had to REWRITE the whole things to please me and my agent. It truly worked, but I AM DETERMINED to get better on plotting so that I don’t have rewrite 400 new pages each time. That was beyond painful. I’m saving your post for future reference. Thanks! I really don’t enjoy revision. Really don’t. Hoping to get enough experience and structure as I write to not need extensive work on plot and stakes. After half a dozen novels, it’s still happening so I might lose this war, lol. This probably sounds a bit crazy but I’ve never written anything, even shorter poems, without doing lots of revision. And I’m probably a bit sick, but I love it. It intimidates me in advance when I think about it, but once I’ve got a working draft and once I actually get into it, I love revising. In my writing, it’s where everything comes together, where my pile of words becomes a novel or poem or story or essay. The thing that keeps me from writing the most is the idea that I won’t have time to immerse myself in the revision. I suppose it’s the former copy editor in me. Panster – Plotter Wars. Ugh. I’m more of a flexible plotter, and I have trouble relating to people who won’t revise their plan, or people who have no plan at all. How could I ever get my story written if I were at either extreme? When I started my WIP, I created a story arc that was longer, wider and deeper than any plot I could ever use. Then I created character arcs, starting with my MC, coming up with 10 – 12 key incidents Then, with my remaining dozen important characters, I did the same. I snipped off parts that didn’t fit inside my plot. Then I wove everything together and created a scene list. Then I wrote my first and last scenes, so I would know where I was starting, and what my story question and answer looked like. Then I started writing. I used my scene list, complete with lots of story and character notes. I learned things about my characters and my story as I went. When I finished Part One, I revisited my story and character arcs and adjusted them as I needed to, and I changed about a fifth of my remaining scenes. At the end of Part Two, I changed well over a third of my remaining scenes. Part Four stayed pretty much the same. Flexibility is key to writing, but so is discipline. I need to know what finished looks like and can’t allow myself to be taken so far away that I can’t ever finish my story. Except when I’m writing Nano-Fiction (100 word stories) then it’s just write and edit – edit – edit. Ha.